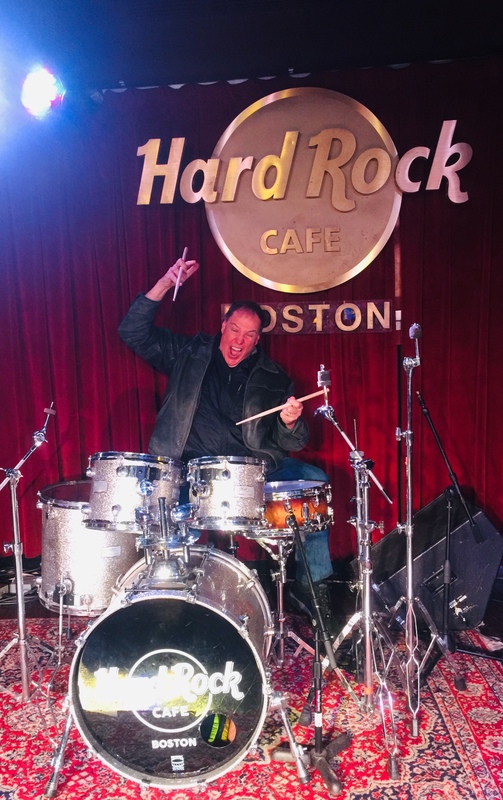 When I first told my friends that I grew up in a Lithuanian family, that we only spoke Lithuanian at the dinner table, that I went to Lithuanian Saturday school for 8 years, that I was a Lithuanian boy scout…they looked at me with a bit of disbelief. On the surface, I looked just like any other American-born kid that grew up in the suburbs. But the home life was vastly different. 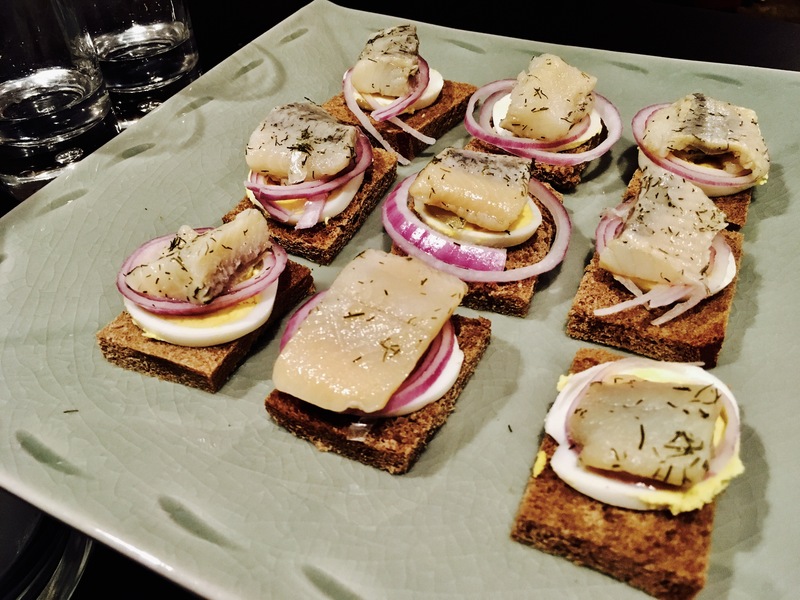 Few things prove you are a true Lithuanian more than an appetite for herring. (Silke (sil-keh) in Lithuanian.) I loved it at an early age. Didn’t matter if it was in a cream sauce with onions, in a tomato casserole with chopped boletes, or perhaps my favorite: an appetizer my Mom prepared only twice a year when my Dad’s buddies came over to play rounds of bridge all night. First and foremost, you need a bottle of good vodka in the freezer. Despite their lack of love for anything Russian, Lithuanians knew a good vodka when they saw one, and Stolichnaya has been the favorite for many years. 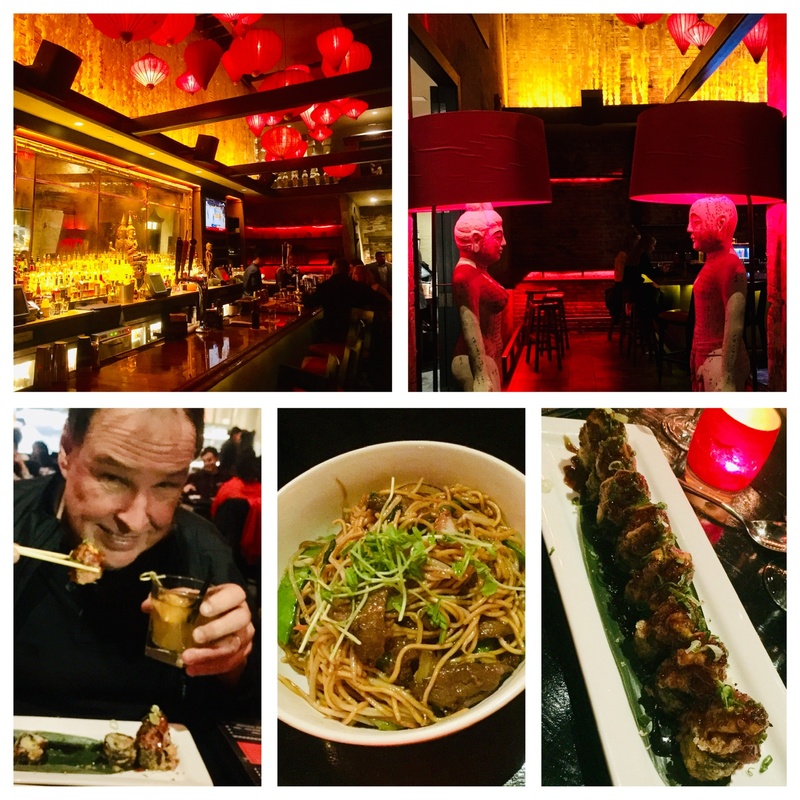 Even now, with hundreds of vodkas to choose from, I still go to the red labeled Stoli bottle for this dish. I find a space in the freezer…jam that bottle in there…and let it get nice and cold. Obviously, good quality herring is essential. Though I can get them fresh when I’m back home on Long Island, the usual choice is from a jar. For me, there’s no better quality than Acme products out of Brooklyn, NY. (If you saw the episode of “Bizarre Foods America” with Andrew Zimmern where he visited a salmon processing plant in Brooklyn, that was Acme Smoked Fish.) You can find them in many supermarkets. Blue Hill Bay herring in dill marinade (an Acme product) is wonderful and can be found at Whole Foods. Next: hard-boiled eggs that have cooled in the fridge. 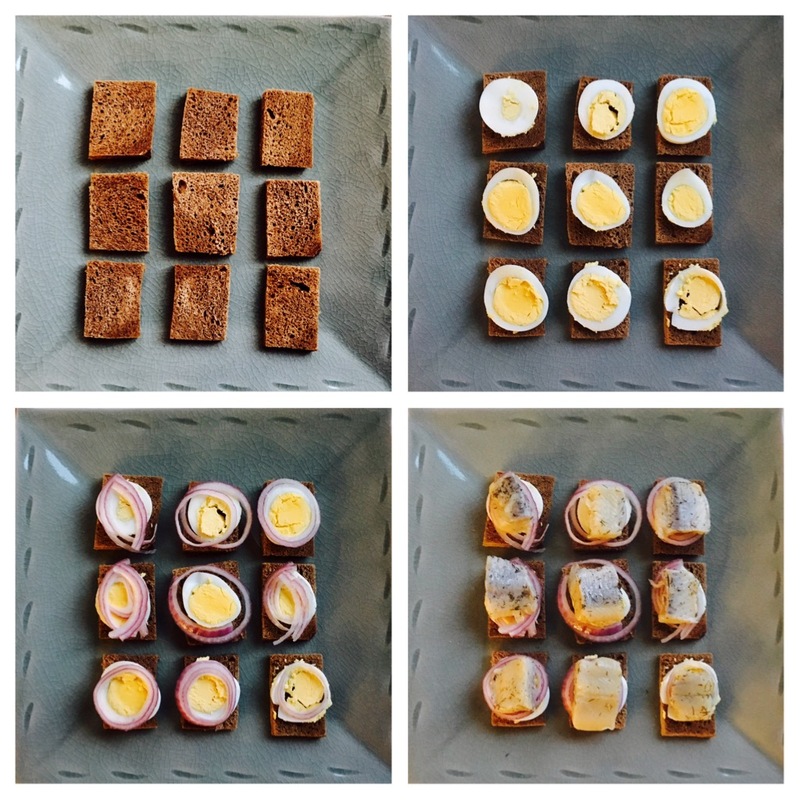 Get out the old egg slicer that’s been sitting in the kitchen drawer for the last decade and use it for this appetizer. Red onion, sliced thin. How much you use is up to you. But it’s gotta be red and it’s gotta be raw. And finally, Lithuanian bread. Yes, there is such a thing. It’s easy to find in most Polish or German food stores in the New York area. I buy a loaf when I’m home and then keep it in the freezer to enjoy throughout the year. Lithuanian bread is like the lovechild of rye bread and pumpernickel. 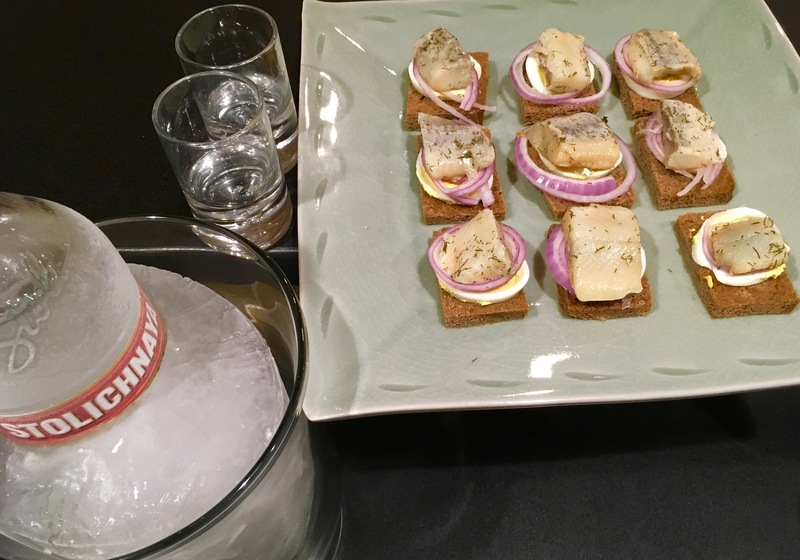 To make the appetizer, simply place a small piece of Lithuanian bread, about 1 1/2″ square, on a plate. Place a slice of hard-boiled egg on top of it. On top of that, some red onion. Then finally, a piece of herring. Pop the whole thing in your mouth, and wash it down with a small amount of frozen vodka. No shots–this isn’t a frat house. Besides, you won’t make it to the end of dinner. Then again, you may not care at that point! I never learned how to play bridge, but I’m sure my Dad would be proud that I remembered this treat. True: the inspiration behind this dish was a conversation I had with friends, talking about our early childhood days. Someone brought up the name Shari Lewis, and her famous puppet Lamb Chop. Next thing I knew, I was grilling the critter in my yard. 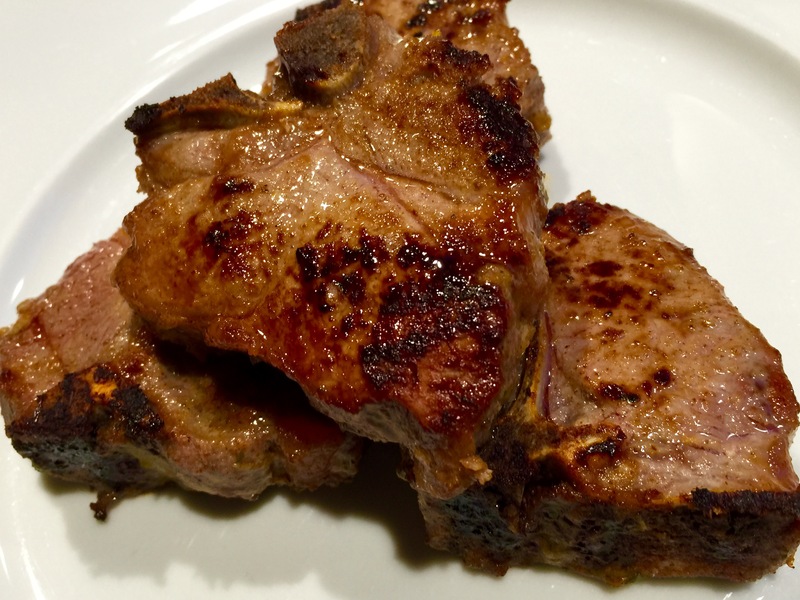 This is a great grilled lamb recipe that works best if you marinate it ahead of time, but it’s not absolutely necessary. Cook it indoors or outside on the grill. I use grapefruit zest and juice in the recipe, but any citrus you like will work. 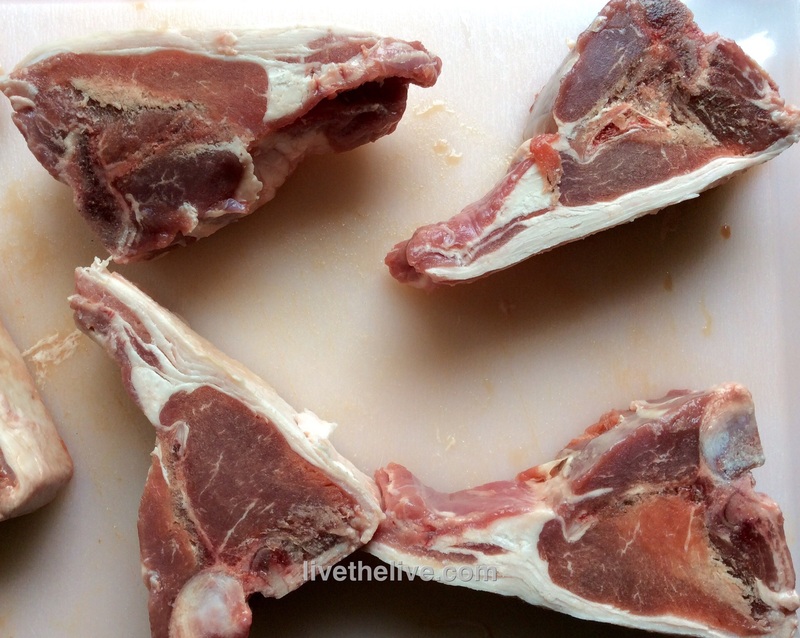 American lamb is different from lamb raised in New Zealand or Australia. If you like a milder flavor, go with the American lamb. 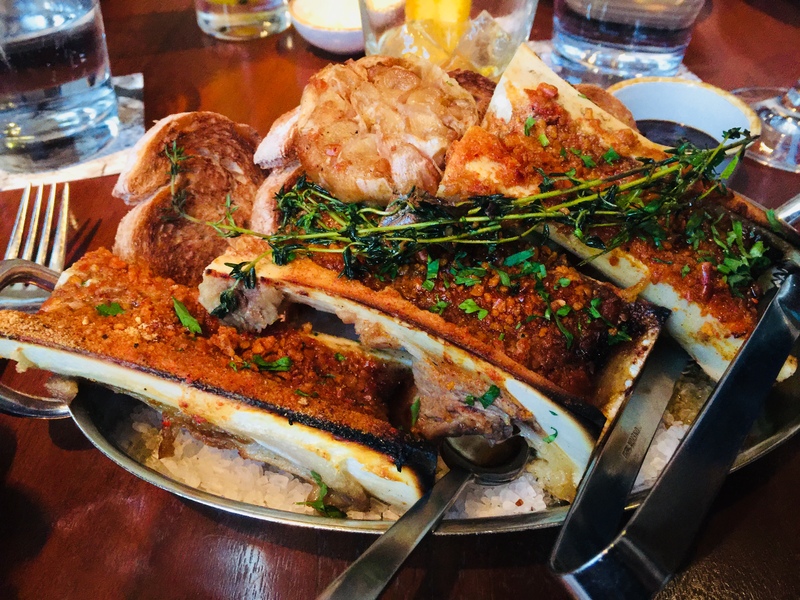 Lamb from New Zealand and Australia is entirely grass-fed, making for a stronger “gamier” flavor but a healthier cut of meat, as all grass-fed meat products are. In a bowl, combine the mustard, grapefruit zest and juice, honey, garlic salt, pepper, and thyme. Mix well. Place the lamb pieces in a Ziploc bag and pour the marinade in, sealing the bag well. Squish the bag around gently to make sure the marinade makes contact with all the meat surfaces. Marinate at least 1 hour at room temperature, or longer in the fridge. Pre-heat a hardwood charcoal grill…or if cooking indoors, pre-heat the oven to 350, and on the stove top, heat an oven-proof pan (cast iron is best) with a little pork fat or oil. On the grill: Grill the lamb on all sides first, then start brushing the marinade on them, flipping them, brushing again, and grilling. Keep doing this until you’ve used up all the marinade and the lamb is cooked to proper doneness. Don’t overcook it! In the pan: Sear the lamb on all sides, then brush all sides with the marinade. Place the lamb in the oven to finish cooking, making sure you don’t overcook it. Let it rest before serving. I live one town over from Fall River, Massachusetts, and just down the road from New Bedford, Massachusetts, two thriving proud Portuguese communities. 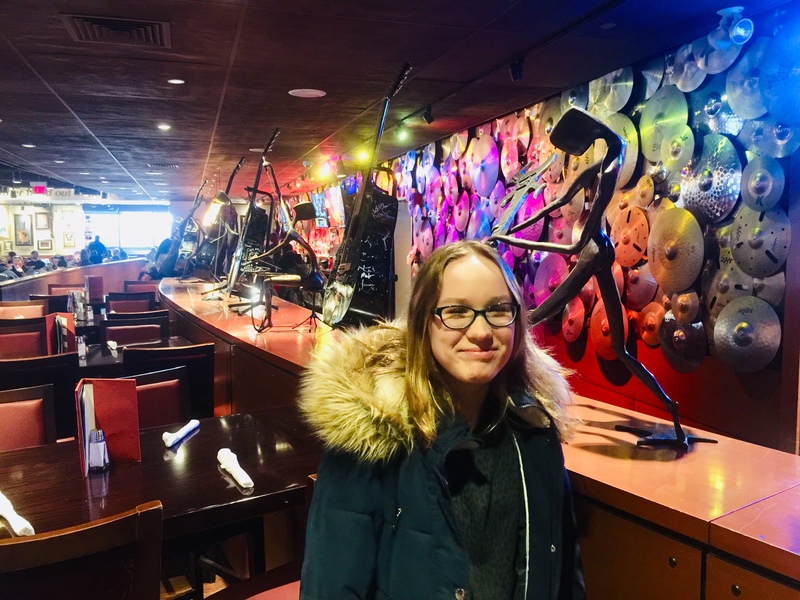 My daughter is in middle school, and she’s taking mandatory Portuguese language classes. 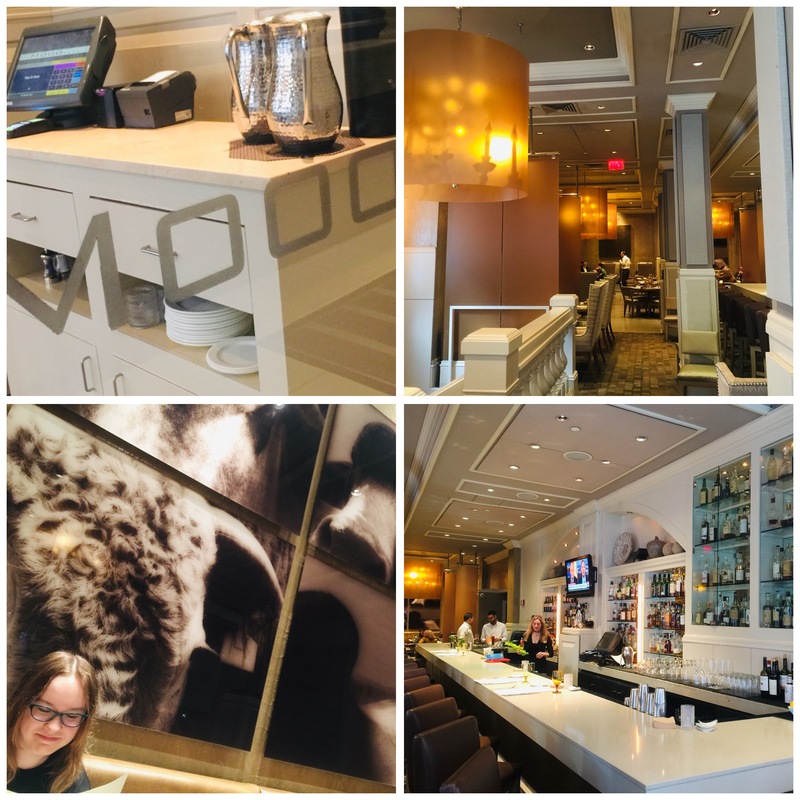 We’ve got dozens of authentic Portuguese restaurants in the area, and even a well-stocked supermarket with its own bacalhau (salt cod) room: Portugalia Marketplace, in Fall River. So when I first posted my recipe of Portuguese kale soup, I was told by many Portuguese friends that my soup wasn’t authentic so I couldn’t call it that. Fair enough. After all, my soup has far less carbs, fewer spices, and uses homemade stock instead of water. It may not be Portuguese, but it’s full of flavor. 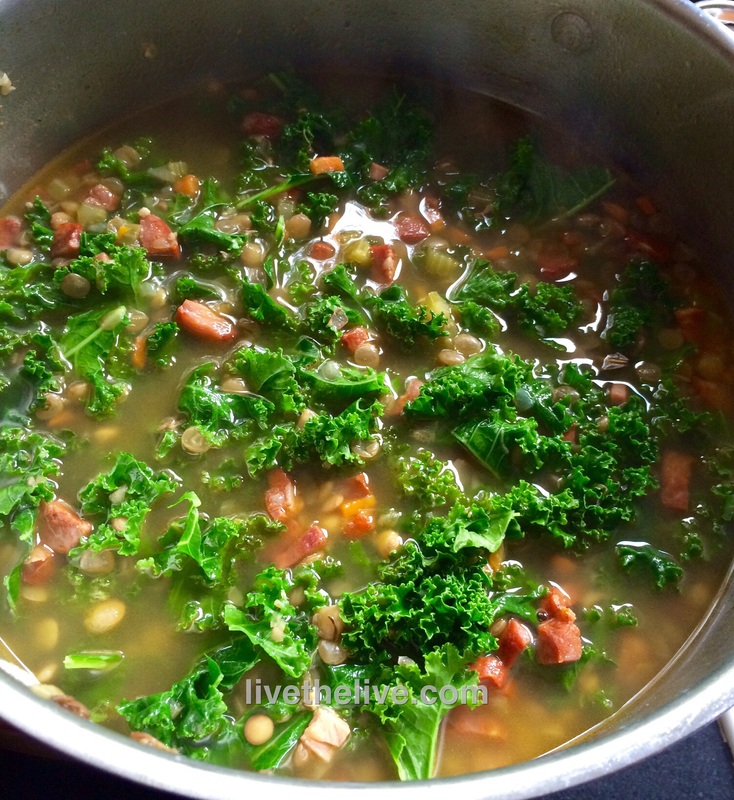 My version of the classic Portuguese kale soup. Add the stock and water to a large pot. Heat until boiling. Add the lentils. In a saucepan with a little olive oil or bacon fat, saute the onions, carrots, celery, and garlic for a few minutes. Add the chopped chourico and saute a few minutes more. Add the contents of the saute pan in the pot. Cook the soup until the lentils are al dente. Taste and season for salt and pepper before serving. My Portuguese pal, Paula, has a great soup recipe that has been passed down from her Mom. Her Mom even adds chicken feet to the stock, which Paula chooses to leave out. Like most Portuguese soup recipes I’ve seen, there’s a ton of carbs: often potatoes with pasta with a lot of beans. But it is good! Drain and puree 3 cans of garbanzo beans in a food processor. Put the puree in a large pot with about a gallon of water. Chop the chourico, and add it to the puree along with the ribs. Boil for 20 minutes. Chop the fennel bulb and cabbage into 2 inch squares. Add the fennel and cabbage to soup and boil for 30 minutes. Add the chopped kale, and boil for 30 minutes. Add the cubed potatoes and before the potatoes are done, add the remaining drained cans of beans. Add macaroni and cook for a short time at the end. 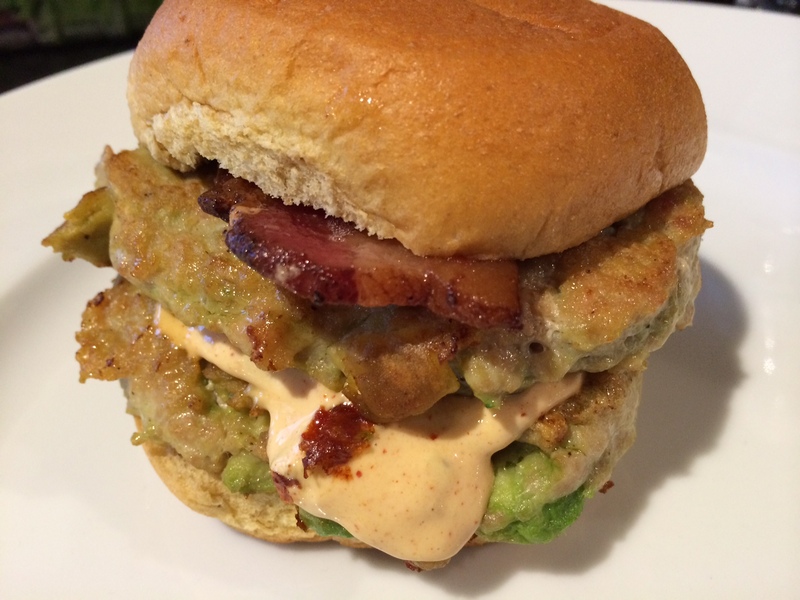 I love avocado, and using it in this chicken burger recipe gives each bite a creamy, fatty richness the chicken needs. It’s a simple burger, with just a handful of ingredients, but it’s really full of flavor. And if you use my Awesomesauce on it (recipe below), it’s even better. If you want to go lo-carb, you can skip the breadcrumbs (and the bun for that matter.) If you’re going gluten-free, simply use GF breadcrumbs and buns and you’re all set to go. If you don’t like avocado, leave it out. There’s still plenty of flavor. Wanna add cheese? Go for it. 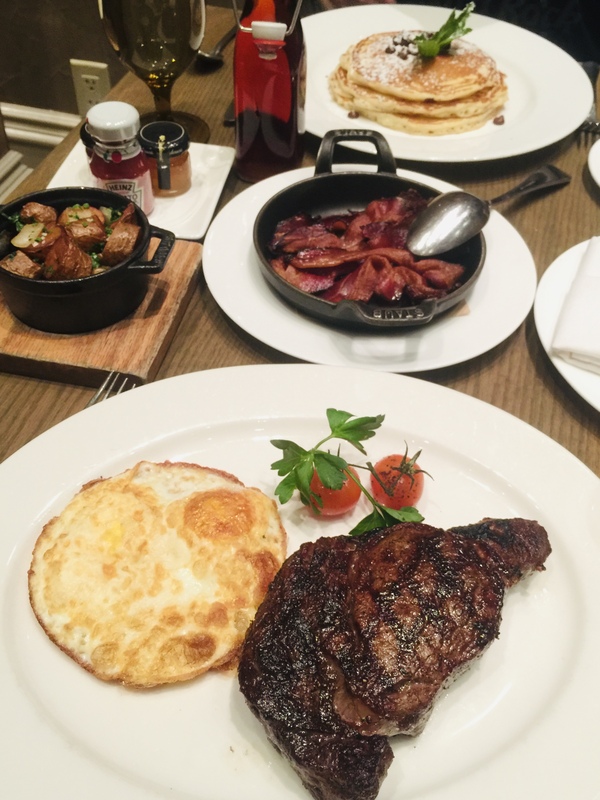 The bacon is optional, but what burger isn’t better with bacon? 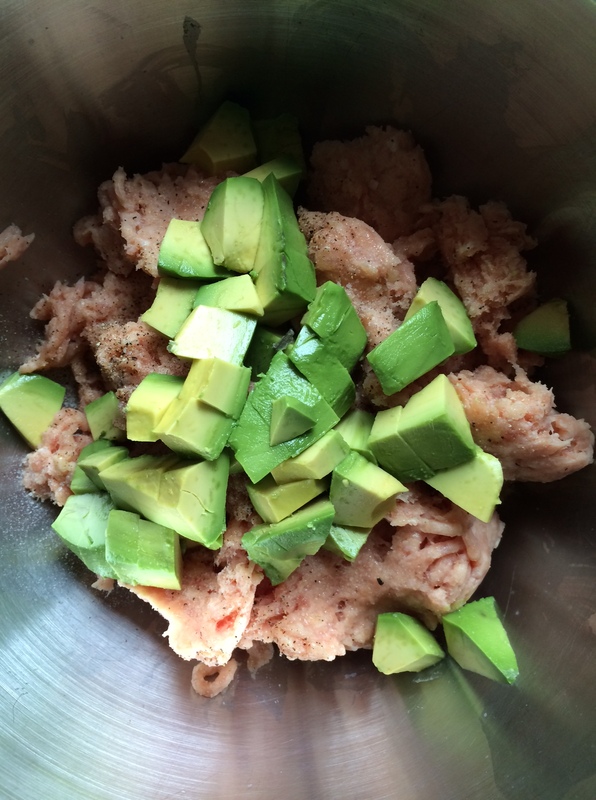 Combine the chicken, breadcrumbs, chopped avocado, salt and pepper, and garlic in a bowl and mix them thoroughly but carefully so that you don’t squash the cubes of avocado. I like to put the meat in the freezer for about 10 minutes to firm up a bit. Form the meat into burger patties. It will be a bit sticky, but just make sure you get the avocado evenly distributed. (I find that using gloves and lightly spraying my hand with avocado oil helps me make the patties without sticking.) Chill the patties again in the freezer for about 10 minutes to firm them up some more before cooking. Heat a little avocado oil (or bacon fat!) in an oven-proof pan, and place the burgers in it when it’s hot. Let the burgers sear on one side, then flip them. (Make sure they sear well, or they’ll fall apart when you try to flip them.) Place the pan in the oven to finish cooking. It’s chicken…so you don’t want to undercook your burgers! Combine all the ingredients in a bowl. Mix well. Refrigerate covered for a few hours to blend the flavors. Sometimes the best ideas come from out of nowhere. I had 5 lbs. 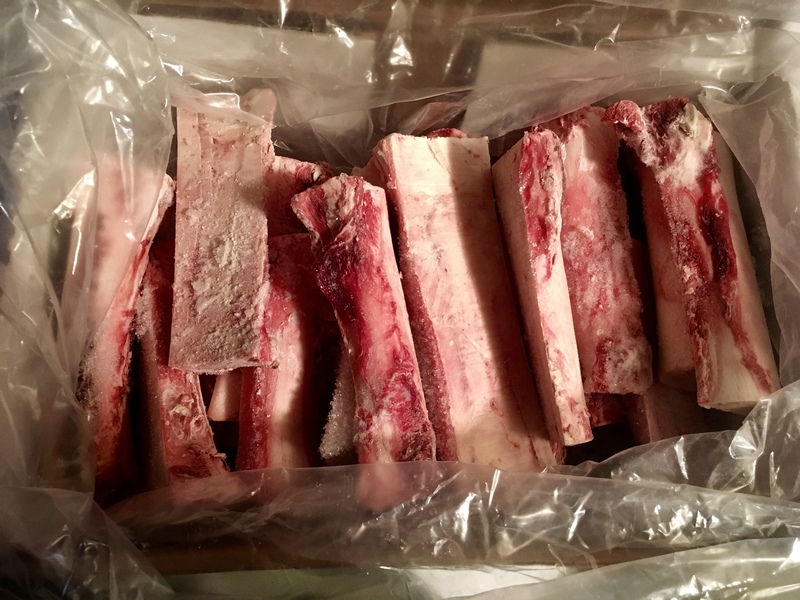 of beautiful St. Louis-style heritage Berkshire (also known as Kurobuta) pork ribs thawing in the fridge, and I knew I wanted to create a new sauce or glaze with them, but I was feeling less than inspired. 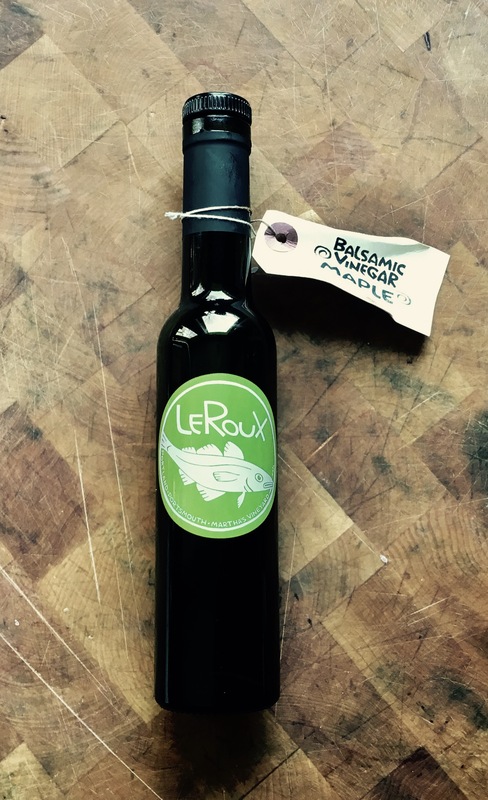 Our food-loving friends, Don and Johanna, showed up at our door with a gift they bought in Maine, at a shop called LeRoux Kitchen. It was a bottle of maple balsamic vinegar. 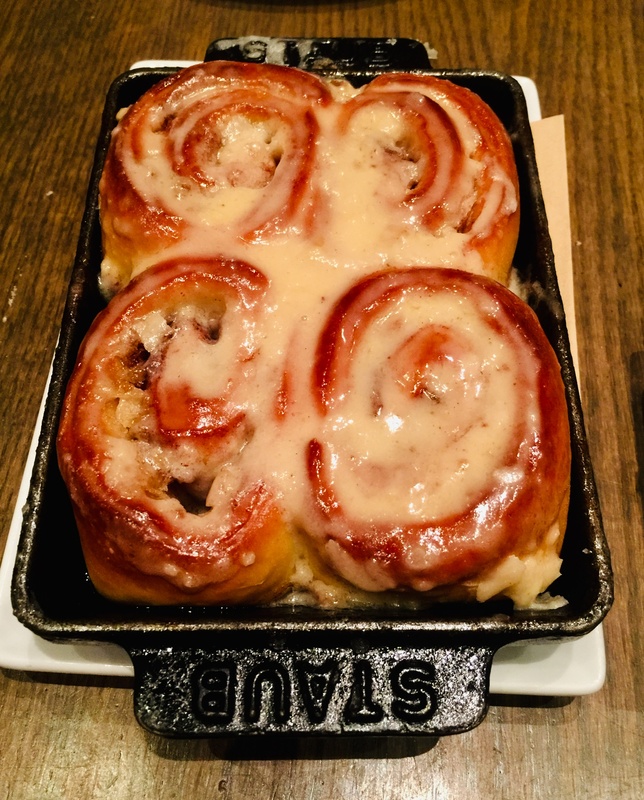 It smelled wonderful…and tasted even better! I knew I had what I was looking for. 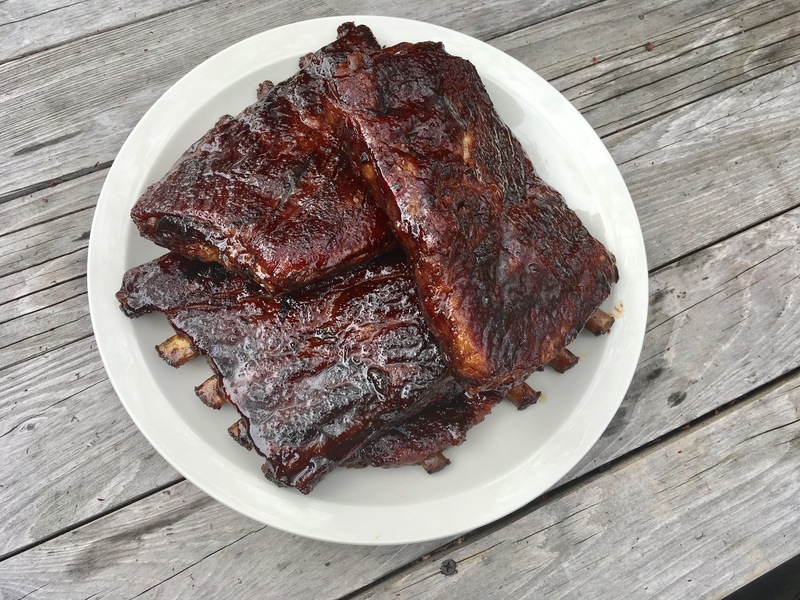 I used a smoker to make these ribs, but if you don’t have one (or just don’t want to bother with one), the ribs are just as awesome when baked in the oven. By the way, if Don (a talented local artist: http://www.doncadoret.net) and Johanna (a talented teacher) aren’t your friends, you can easily make your own maple balsamic vinegar by combining a 1/2 cup of balsamic (not the super-expensive kind, but the $9-a-bottle kind) with 1 tablespoon of maple syrup. Add more or less maple to taste. 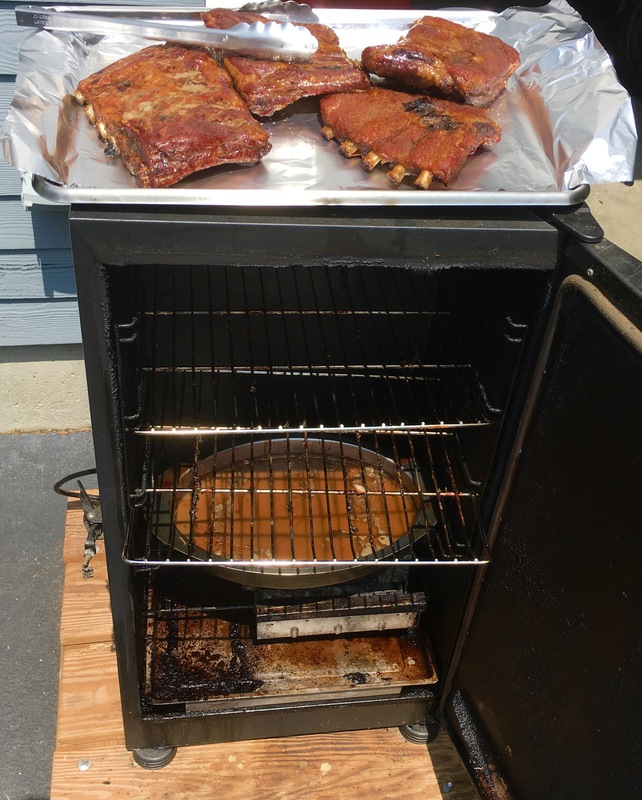 Yup…my smoker…she’s been used a few times! I use an electric digital smoker made by Masterbuilt. I like the fact that I can set the temperature and time, and not have to constantly watch it. It has a side chute where I can add smoking chips when I want, and the results are consistent. I suppose some grilling fanatics might say I’m cheating, but a digital smoker allows me to live a life, hang out with my family, do some yard work. I don’t have time to babysit. 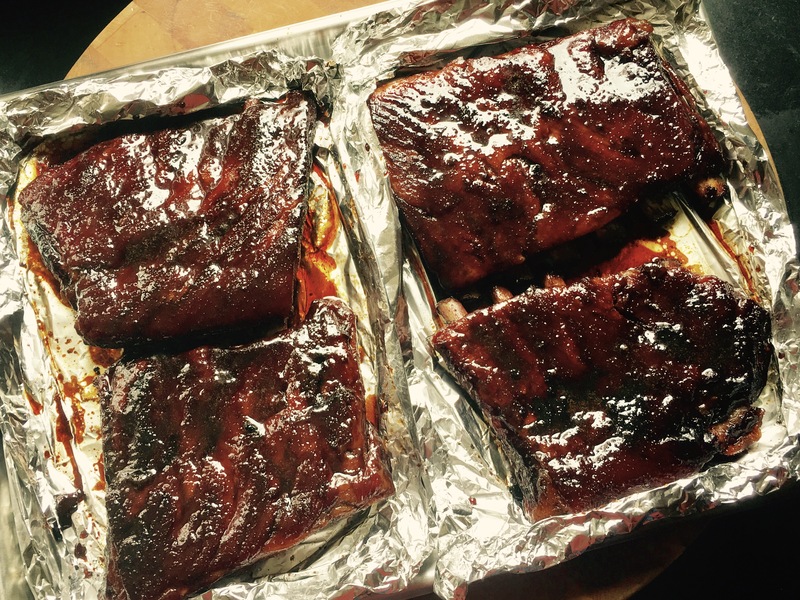 Although I always use a water bath in my smoker, the ribs still come out visibly dry, so I like to brush them with a glaze, wrap them in foil and finish the cooking process in the oven. The glaze flavors the meat and also adds a little steam that tenderizes it. Brushing with glaze, then wrapping in foil. 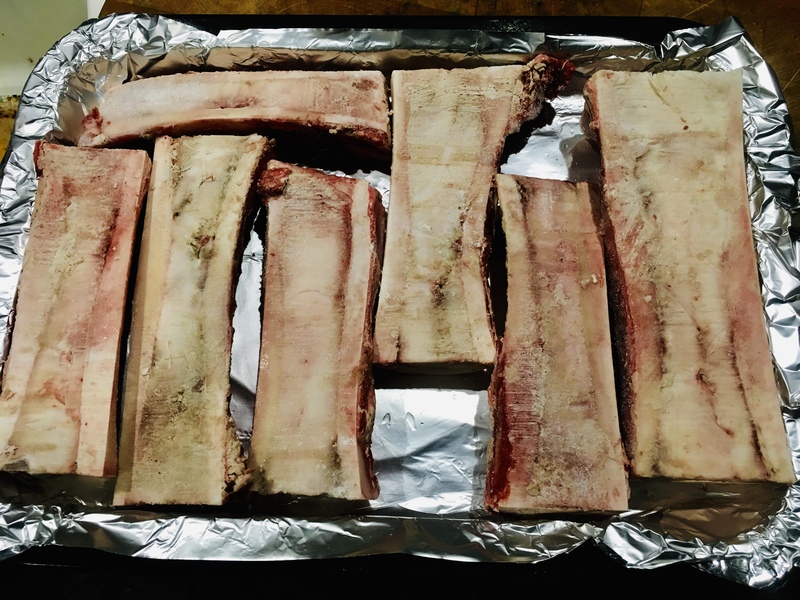 Prepare the ribs by removing the inedible skin on the back of the rack. The easiest way to do this is to cut a little “tab” of skin, then pull it with your fingers. Holding the skin with a dry paper towel will help your grip. I cut the racks in half to fit my smoker. In a saucepan over high heat, combine the water, maple balsamic vinegar, brown sugar, onion, garlic, and cayenne pepper sauce. Stir well, and let it come to a boil. Let it reduce by half, leaving it still watery. Set it aside. 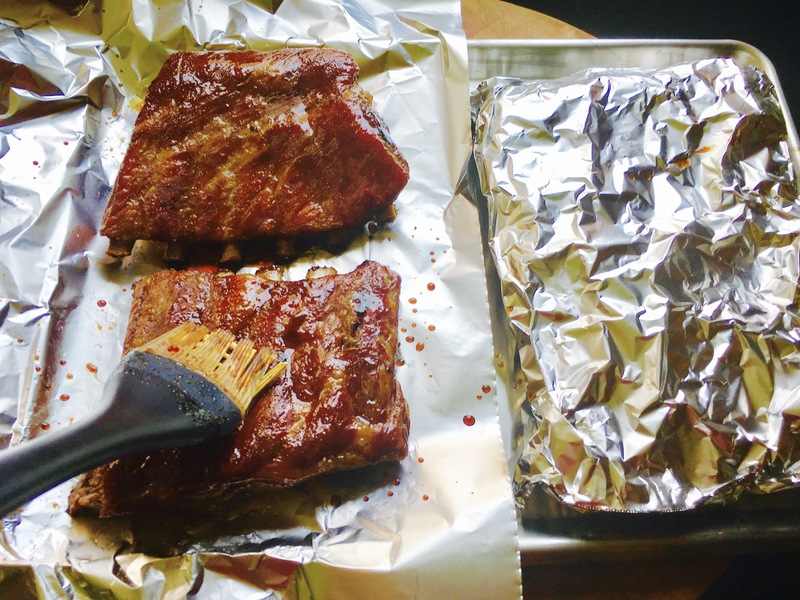 After 3 hours, remove the ribs from the smoker (or oven), placing them on a sheet of aluminum foil. (I use Reynold’s Non-Stick Foil, since the glaze will be sticky.) Brush both sides of the ribs with half of the glaze, and place the ribs meat-side-up on the foil before sealing the it around the ribs. Place the aluminum foil packets on a baking sheet, then into a pre-heated 250-degree oven. 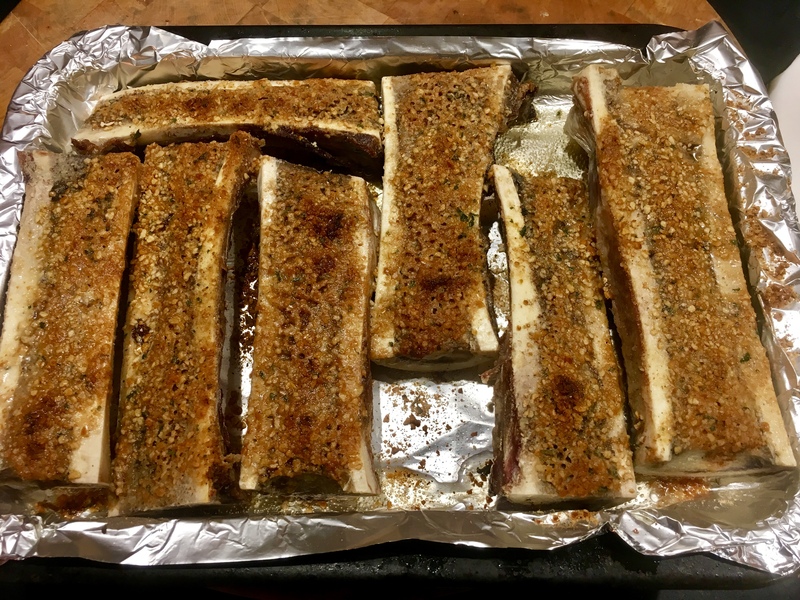 Remove the ribs from the oven after 1 hour. 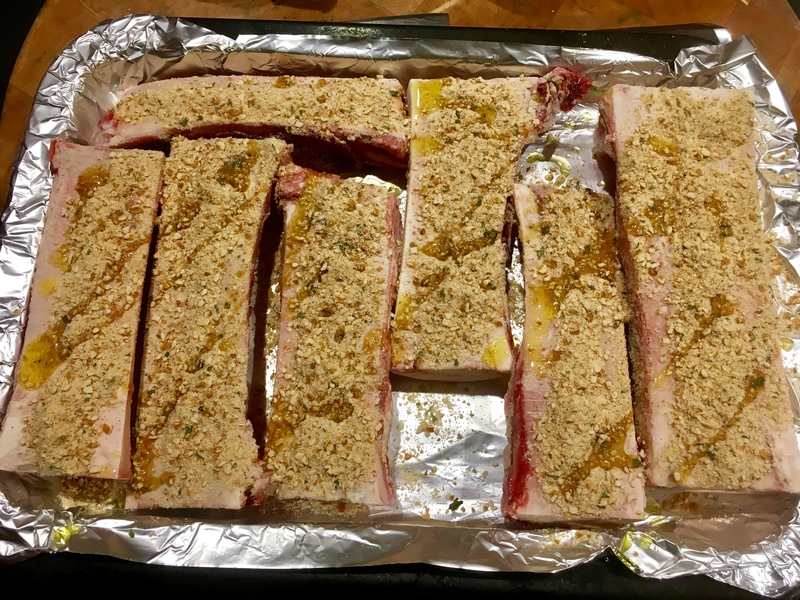 Open the foil packets so that the ribs are now exposed. Brush the top of the ribs one more time, then put the foil back over the top and cook for 1 hour more. As a teenager growing up on Long Island, I worked long hours at a local Italian restaurant called Pizza City East in Plainview. (The original Pizza City was in Ozone Park, Queens.) Though the pay sucked, I made some important friendships that have lasted to this day. 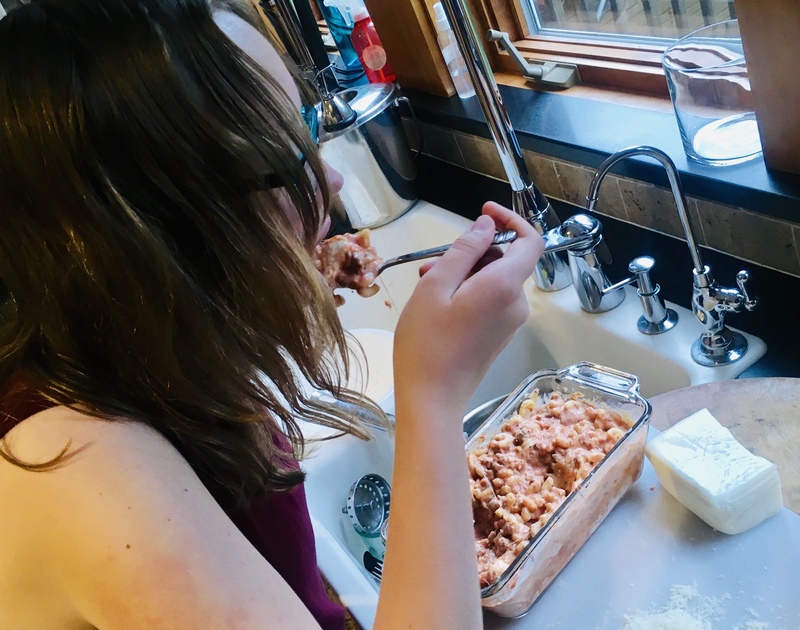 I also learned many Italian cooking basics: how to open clams for red and white clam sauce, the secrets of great pizza dough, the art of a perfect espresso, and how to make massive quantities of baked ziti. 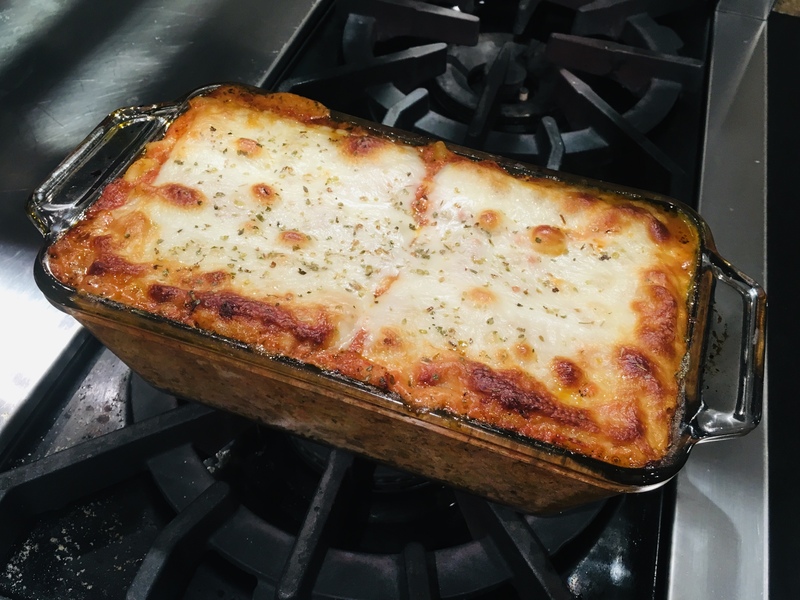 When I got older and I shared an apartment with my buddy, Don, we would regularly invite a large crowd of people over for a party, and a huge tray of baked ziti was an inexpensive and hugely popular way to feed a crowd that was doing some serious drinking. The basic ingredients of baked ziti are the same as lasagna, the main difference being the wetness factor. 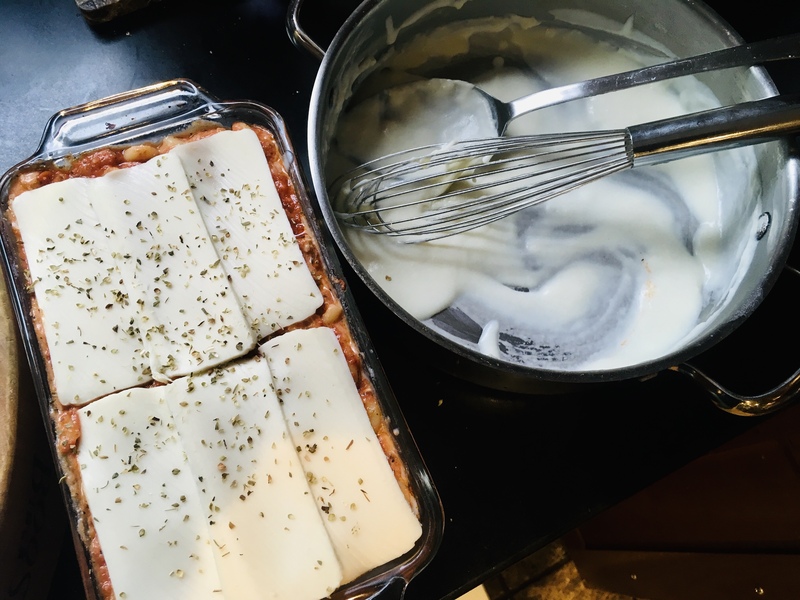 If you make lasagna too wet, the thing will fall apart when you try to slice it. But baked ziti is meant to be sloppy, and it actually shines in its incredible gooiness! 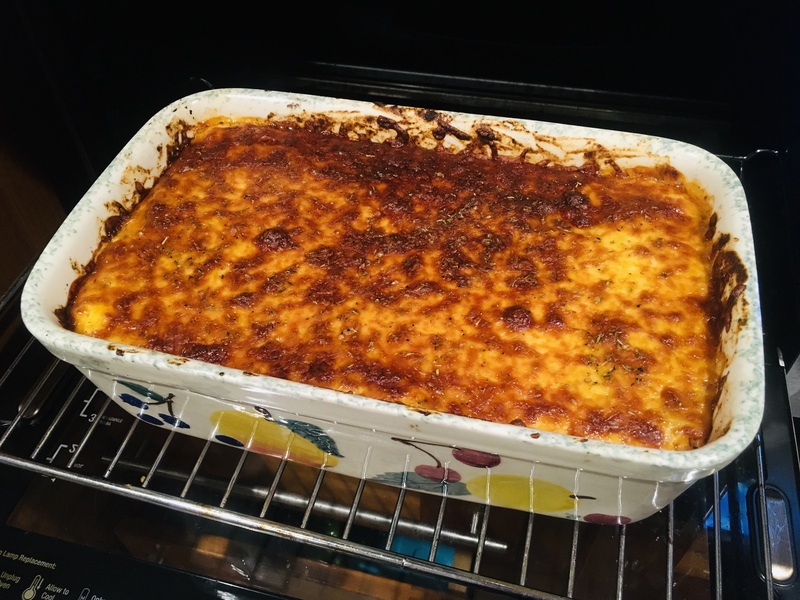 My baked ziti consists of 2 sauces (a meat sauce and a bechamel sauce) and 4 cheeses (ricotta, mozzarella, provolone, and Parmigiano Reggiano) using pasta that is boiled much firmer than al dente. Technically, I like to use penne, not ziti. It’s firmer, and really works well with this recipe. And there are plenty of great pasta choices out there for gluten-free diets. Our favorite brand of GF pasta is Garofalo. Heat a tablespoon or 2 of olive oil in a large pan and sauté the onions until translucent. I finely chop the carrots by peeling them all the way down until there’s nothing but a pile of peeled pieces, then chopping them up so small, they almost melt into the sauce. Add the carrots and cook for 2 minutes. Add the beef (or pork) and cook the meat until it browns. Add the parsley, oregano, basil, salt and pepper and mix well. Empty the can of tomatoes into a blender and blend it until smooth. Add this to the pan and mix well. Cook the meat sauce for about 10 minutes, then remove it from the heat and set it aside. Bechamel is a basic white sauce. It adds a wonderful creaminess to lasagna or baked ziti. Melt the butter in a saucepan under medium heat. Add the flour and whisk until you’ve combined the butter and flour and have a light roux. Add the milk, and keep whisking, making sure you don’t get any lumps in the sauce. Season with the salt and pepper. Keep whisking until the sauce thickens. Once it does, remove it from the heat and set it aside. 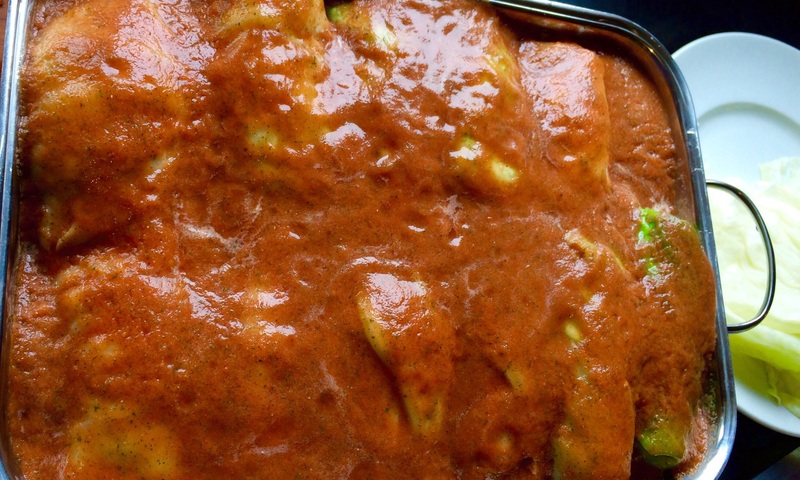 For baked ziti, use a deeper pan than you would for lasagna, about 4″ deep. Take several large spoonfuls (about half) of the meat sauce and the béchamel sauce and mix them together in the pan. Boil the pasta in a pot of salty boiling water until very firm…firmer than al dente. Drain the pasta and pour it into the pan with the sauces. Mix really well. Tear the slices of provolone and add them to the pan, mixing them in. Mix in the ricotta cheese, and handful of the mozzarella, and all the Parmigiano Reggiano, stirring really well to get everything mixed together. If there’s still room in the pan, keep adding equal parts meat sauce and béchamel sauce until you’ve used them up. Smooth the top of the ziti mix flat with the back of a large spoon, then sprinkle the remaining mozzarella evenly over the top. Sprinkle a little oregano on top, and place the pan in the oven to bake for 30 minutes, or until the mozzarella on top is a beautiful golden brown. 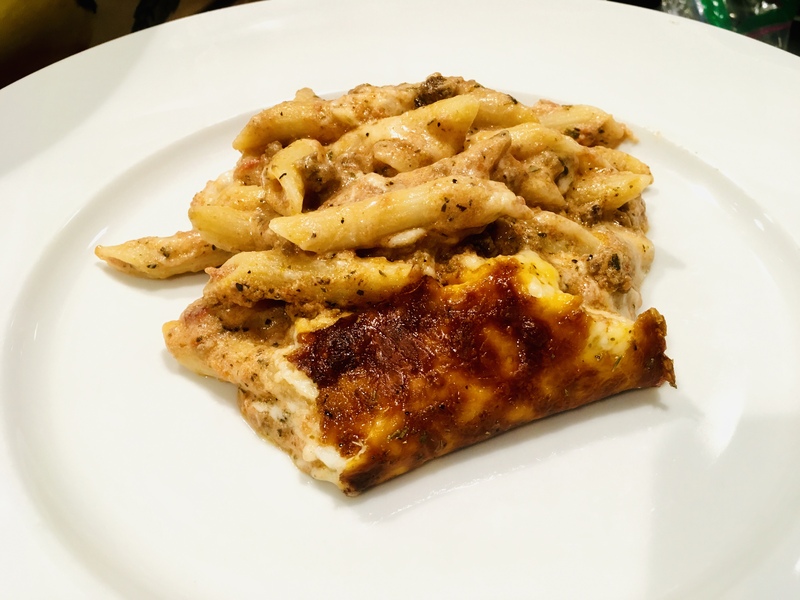 The best mac and cheese ever: baked ziti! If there’s a dish that my Mom made all the time but I didn’t appreciate until I got older, this is it. 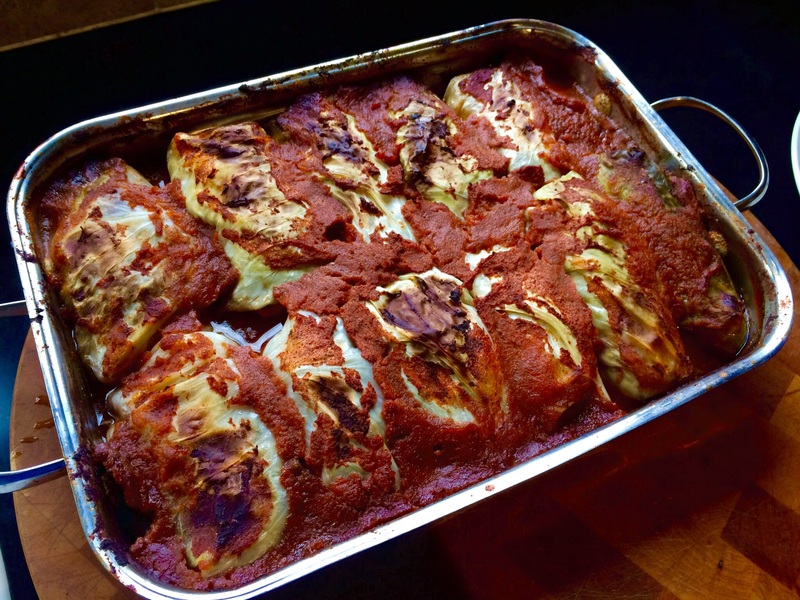 Stuffed cabbage, cabbage rolls, or balandėliai, as we say in Lithuanian, was a staple in our home and one of my Dad’s favorite foods. I had seen my Mom make these beauties so often in my childhood, I didn’t even need to check online recipes out for guidance. That doesn’t mean I make them exactly like Mom, but my version came out pretty damn good. I think Mom would be proud. As always, to keep this dish gluten-free, I simply toast some GF bread slices in the oven, then grind them in the food processor. 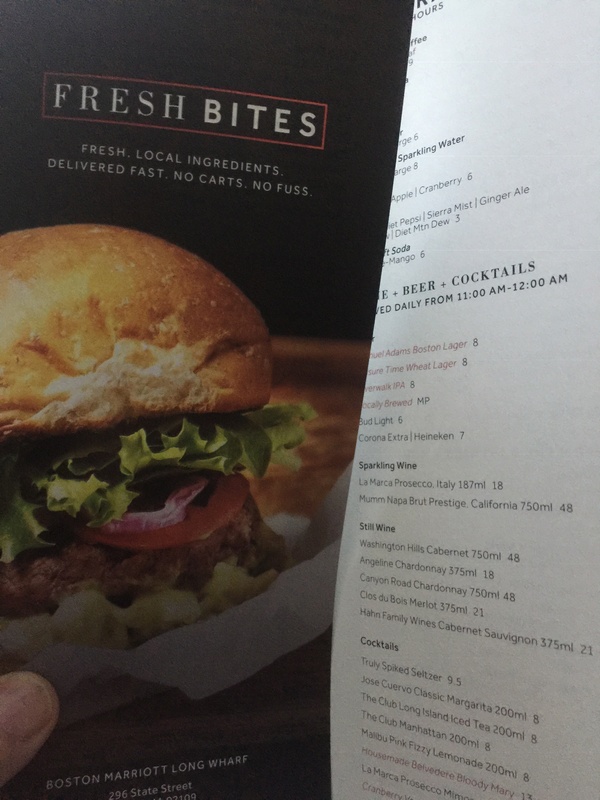 Way better than buying pre-made GF breadcrumbs! Chop the bacon into small pieces and fry them until crisp. Finely chop the onion, and add it to the bacon and rendered fat in the pan, cooking until the onions are translucent. Add the salt, pepper and garlic. Mix well, and remove from the heat. Let it cool to room temperature. In a large bowl, combine the beef, pork, breadcrumbs, eggs, and cooled bacon and onion mixture. Place it in the fridge to firm up. Let a large pot of salted water come to a boil. Core the cabbage, leaving the leaves whole, and carefully immerse the head of cabbage into the hot water. Little by little, the outermost leaves of the cabbage will come off the head, and you can remove them with tongs, so you don’t burn yourself with the hot water. Set the leaves aside to cool, and continue doing this until you can no longer remove leaves from the remaining head of cabbage. 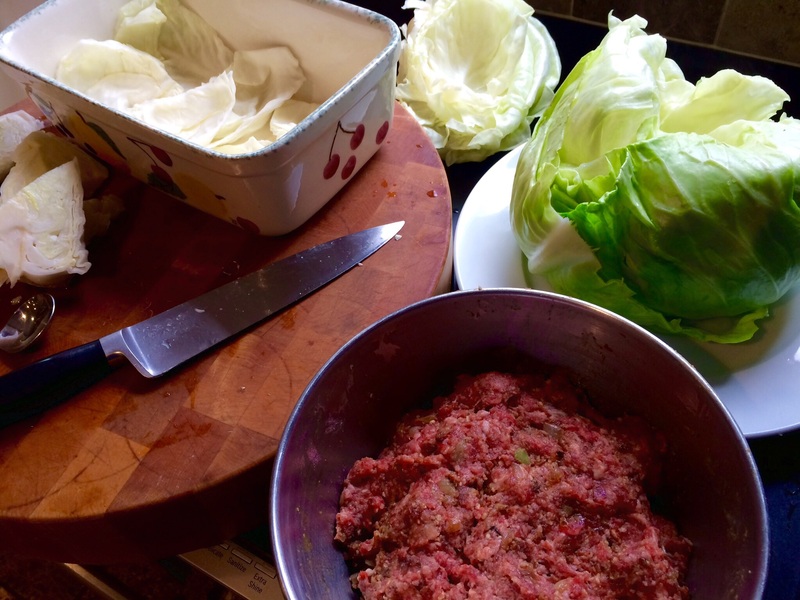 Remove the remaining head of cabbage from the hot water, and using your hands or a knife, break it into flat pieces. Line the bottom of a roasting pan with the pieces. 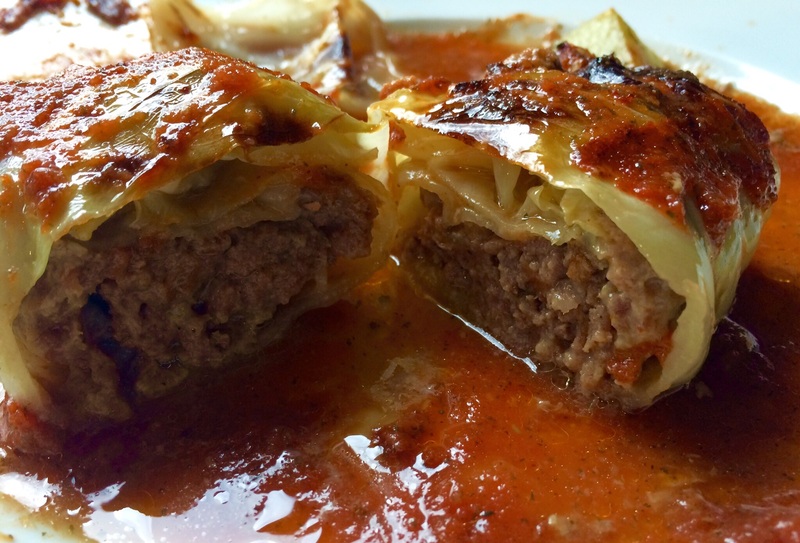 These will keep the stuffed cabbage from burning and sticking to the bottom. 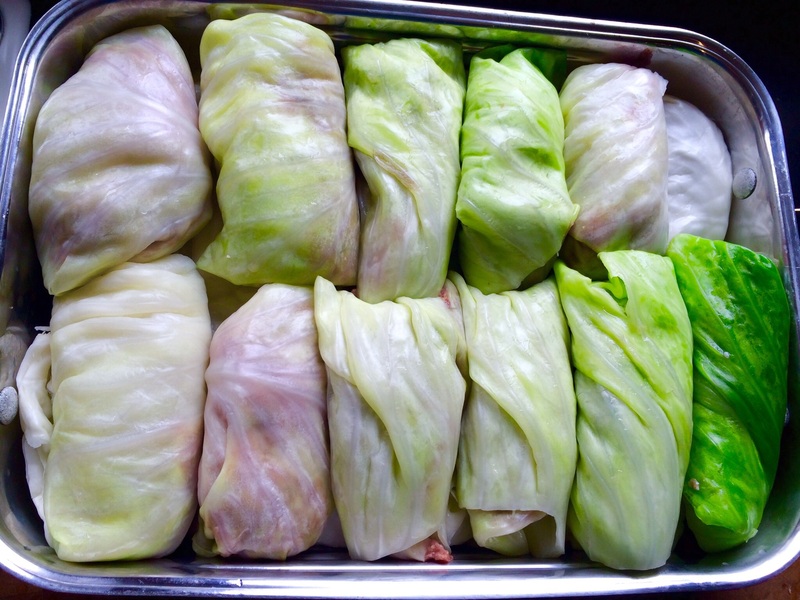 Continue stuffing and rolling the cabbage leaves until you’ve got a pan full of them, shoulder-to-shoulder. In a blender or whisked in a bowl, combine the stock, diced tomatoes, thyme, salt, pepper, garlic and onion. Pour this mixture over the top of the cabbage rolls in the roasting pan, covering them. If you have leftover cabbage, you can place another layer of them on top. Otherwise, cover the roasting pan with foil and place in a pre-heated 350 degree oven. Cook for an hour. After an hour, remove the foil and cook further for another 45–60 minutes. The popularity of overnight oats seems to come and go. Now I’m finding more and more articles about it again. I suppose cooler weather makes us think of oatmeal, but to be honest, I’m not a fan of hot cereals. I wake up at 4AM for work every day, so to have something tasty and healthy already waiting for me, next to my carafe of iced coffee in my fridge, is awesome. This is my favorite way to get my oat fiber, and it’s absolutely delicious and simple to make. Doing some research, I noticed that many overnight oats recipes contained almond milk, which some people think is a healthy alternative to regular milk. The reality of it is: it’s not…unless you make it yourself. (See how at the bottom of this blog.) Store-bought almond milk has little or no nutritional value–or almonds, for that matter. The same goes for soy milk: non-organic soy is often grown with Monsanto’s Roundup-ready products. I happened to grow up as a kid that loved, and still loves, dairy, so I go for organic grass-fed milk. (The amount of fat in the milk is up to you. I use whole milk and add some water to it.) The chia seeds in the recipe add anti-oxidants and omega-3’s, but they’re optional if you don’t like their slippery texture. Cinnamon has some health benefits, too, but it’s mainly here for flavor. And I use frozen organic blueberries in this recipe, but any frozen or fresh organic berries (or sliced organic apples!) will work. 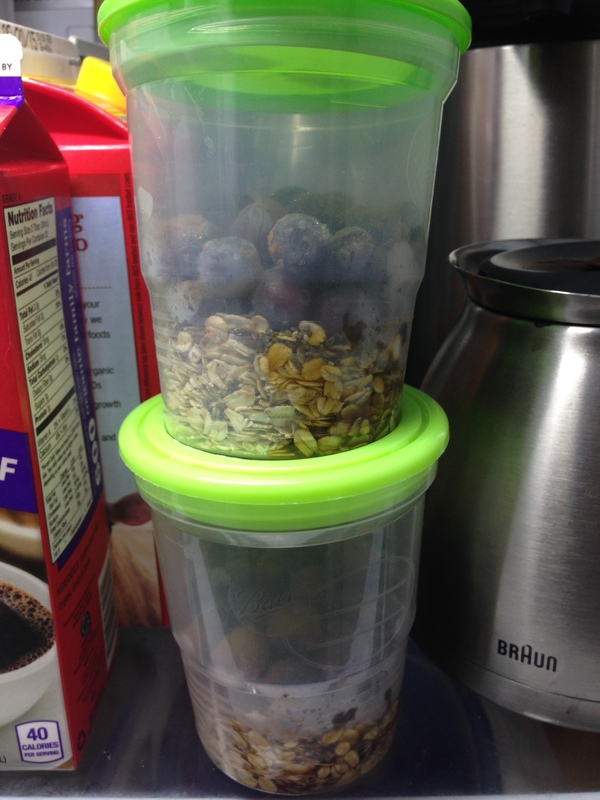 Combine the ingredients in a container that seals tightly. Give it a good shake and refrigerate it overnight. Eat it the next morning. Start with raw, organic almonds. Take 1 cup of the almonds and place them in a Mason jar (no lid). Cover the almonds with water and let them soak overnight. 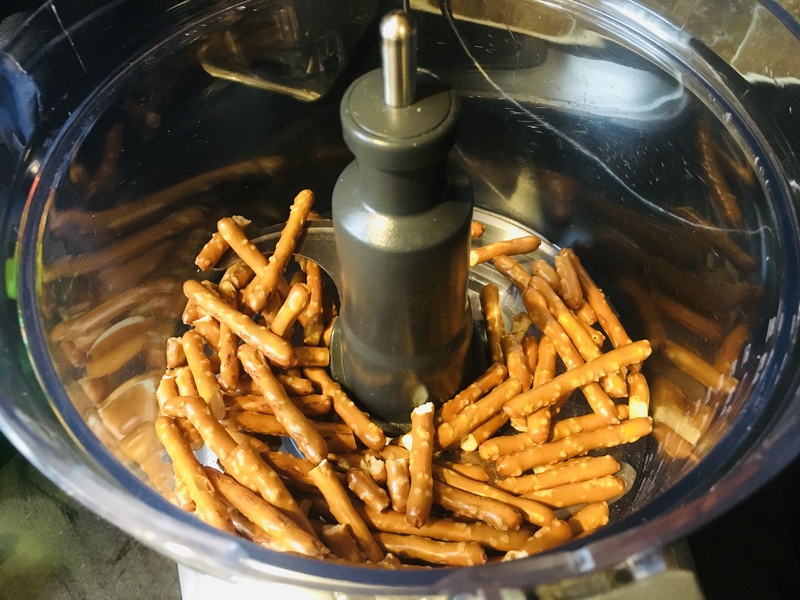 The next day, pour the water off, and place the almonds in a food processor. Add 2 cups fresh water and process the almonds on high for 2 minutes. Strain the liquid through some cheese cloth, squeezing out as much liquid as you can, and you’ve got real almond milk! (Throw the solids into your compost pile.) Sweeten it, if you like. It doesn’t keep for a long time, so make small batches, and keep them sealed in the fridge.